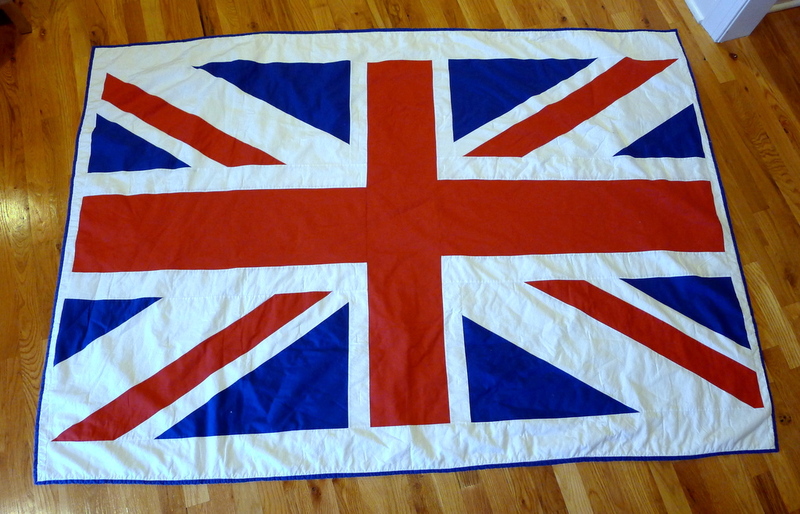 The front is a Union Jack I pieced with Kona solids in white, red, and royal. The back is a custom-printed 1 piece of the London tube map. It did not work out well, and after months of figuring out the graphing for the map (I didn’t have EQ software, I did it by hand) and experimenting with the construction, I abandoned the idea and gave him something else instead. Then this fall I had the idea to try again to make him a British quilt for Christmas, but this time it hit me that piecing together a Union Jack would be much easier than piecing together the map. I decided to see if I could have one big piece of fabric printed with the map, an idea I got from Tula Pink’s fantastic custom quilt backs. 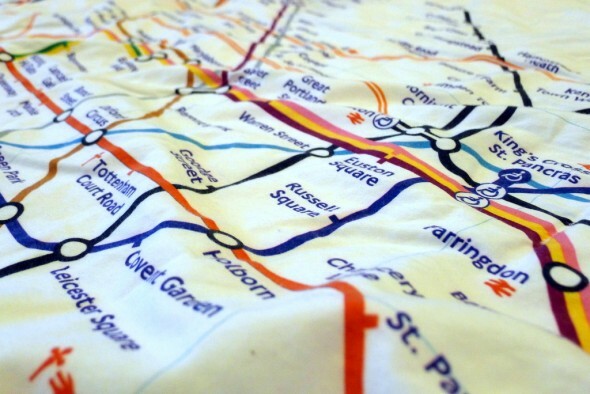 I found First2Print, a NYC/LA company that custom prints fabric. Romalia helped me out big time with fabric choices, test swatches, the whole bit–it was worth every single penny. 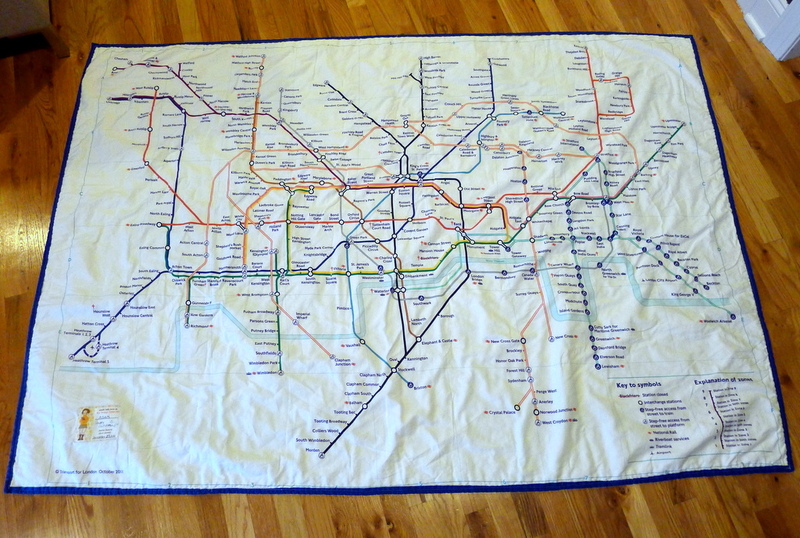 It’s 56″ high (that’s as wide as they could print on the cotton fabric I chose) by about 2.1 yards long. The size of the map on the back definitely dictated the overall size of the quilt and the flag on the front. 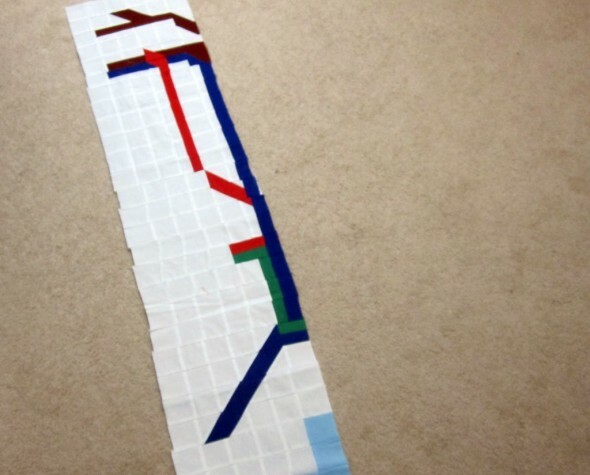 I didn’t want to have to add a border to the map backing, so I scaled everything on the front to fit. 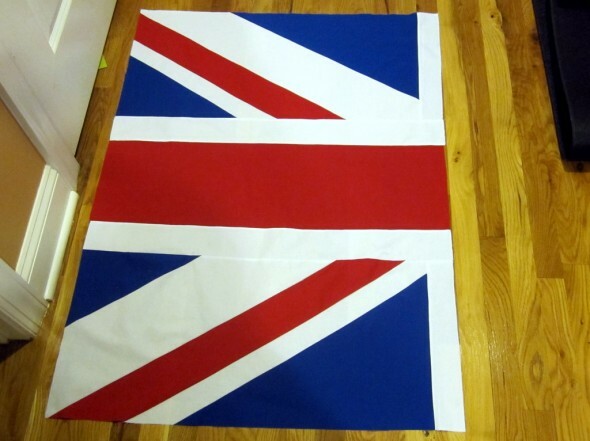 I wish I could give a detailed tutorial with exact measurements for the flag on the front. The truth is I tried and failed to use the shiny EQ7 software I got for my last birthday. I tried to take an EQ class over the summer but found it didn’t really cover the things I needed to know. 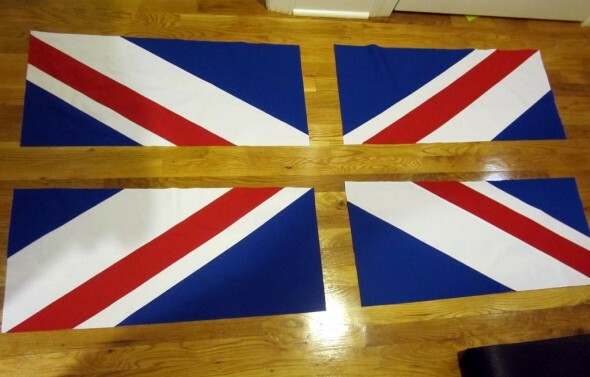 Every time I tried to turn the Union Jack image into angles with measurements, it condensed it into simplified blocks that looked nothing like the original design. 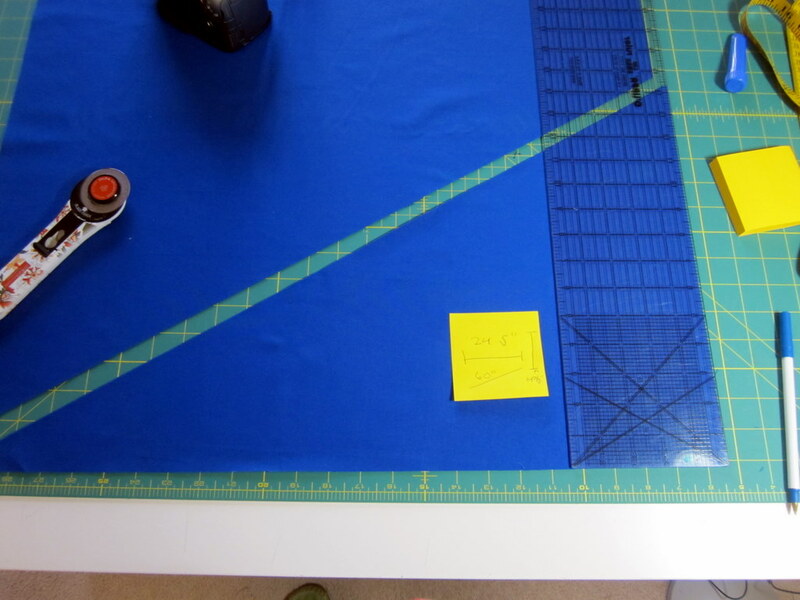 So in the end, I used the software as a great big grid ruler. And that was really helpful as a starting point, to lay out the flag at the size I wanted for the quilt and use the software’s grid lines to figure out length and width for the blue triangles. That’s how I started. 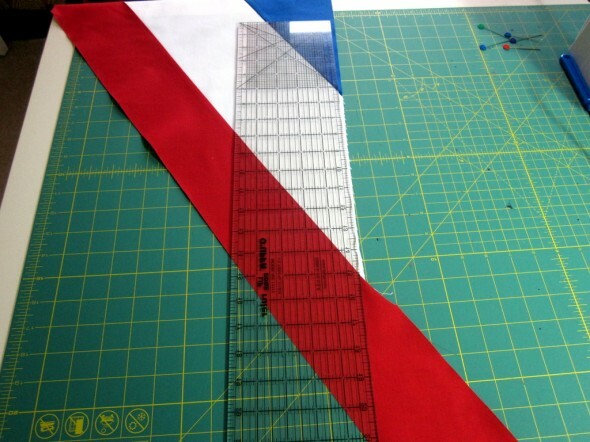 Everything is at a 60 degree angle, so then I figured out the sizing for the white and red strips in each corner of the flag. 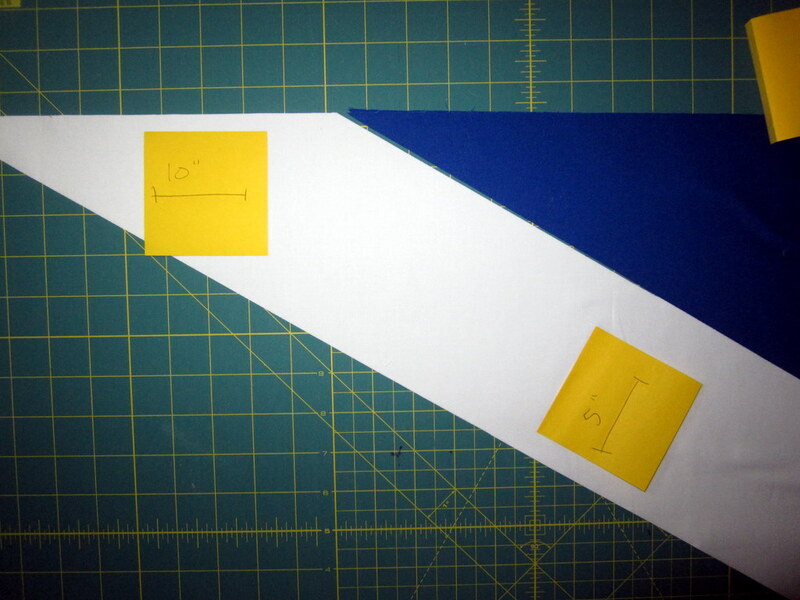 But even my measurements had to be fudged as I evened out the four corner segments. Somehow the same pieces in different corners ended up taller or wider than the first corner section, even if I cut strips exactly the same size. So I had to cut and trim everything down to get 4 exactly even sections, which means I have no idea what the final measurements were. Once I had the corner pieces evenly made, the the red and white cross sections were really easy to measure and figure out. I finished the top and then measured a white border to even it out with the size of the map on the back. I stitched it together like a tie quilt because Adam prefers that to all over quilting. Then I bound it in royal Kona. Like I said, I love it. It’s a perfect couch size, and even though all of the blue triangles don’t match up perfectly I still think it’s one of the coolest looking quilts I’ve ever made. I never work with solids like this, and now I kind of love it. Merry Christmas, Adam! This is the coolest quilt I have ever seen! 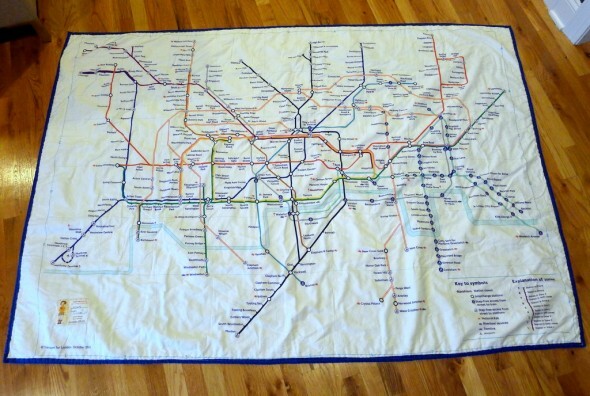 I have been wanting to make my husband a quilt exactly like this! Is there any tips you might have? I am not an advanced sewer- I’m more intermediate ish, I just want it to turn out well and not want to rip my hair out from difficulty. Thank you! I’m an intermediate, too, I would say. It did make me a little crazy figuring this out, but that’s because it had to fit the backing fabric I used. 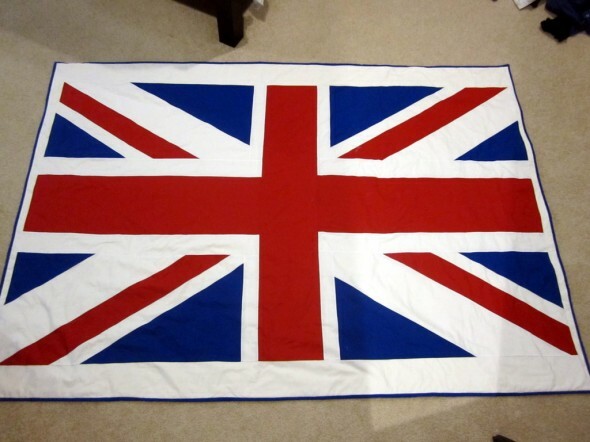 These Wikipedia links really helped me a ton: http://en.wikipedia.org/wiki/Union_Jack#Specification and http://en.wikipedia.org/wiki/File:United_Kingdom_Flag_Specifications.svg. The second one is awesome because it shows the exact dimensions of everything on the flag, so if you can scale up the math a little to make it the size you want, it’s really straightforward. Or you can make it actual flag size and put a thicker white border around it. Good luck! I’d love to know how it turns out!